Personality: Kind and intimidating, Mjoll is extremely loyal and has a great sense of morality. She can be patient, but as a Nord even that eventually wear thin. Bi. History: When Mjoll was a child, her village was burned to the ground by bandits. She lost all but her father, and grew up hunting with him. Eventually she decided to become a fighter rather then a hunter, and honed her skills in all that it meant. She was adventuring in a Dwarven ruin called Mzinchaleft, she nearly was killed within its final chamber by a Master Dwarven Centurion. She was rescued by a dear friend Aerin, however she lost her sword Grimsever. In thanks to Aerin for her rescue, Mjoll became Riften's 'protector', deciding to help defend the citizens from the corruption and Thieves Guild. 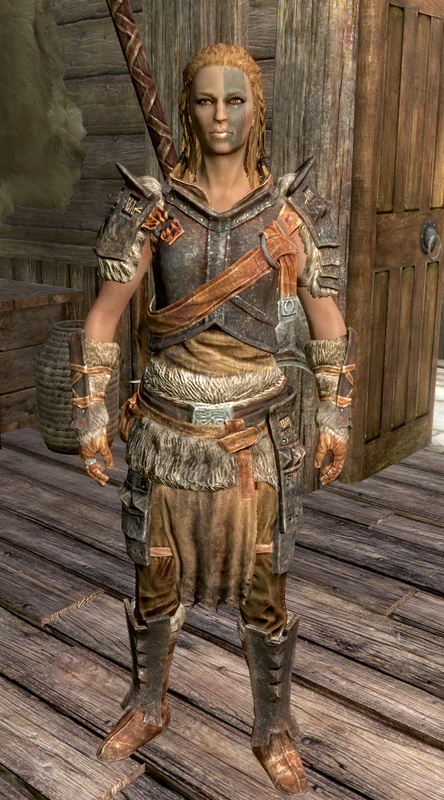 One day, a Redguard woman showed up, and talked with her. And talked. They soon became friends, and one day Yosa'Min showed up with her lost sword and a grin so wide it made Mjoll think the woman had lost her mind. They traveled for around a half a year when Mjoll found out that Yosa'Min was in the Thieves Guild. While she had had her suspicions, it still was such a shock. They fought, and went their separate ways... Mjoll got back to Riften, and found herself missing the Redguard, and occasionally would see her slipping into the Thieves Guild through the cemetary. At last, she decided to give Yosa'Min a second chance, only to find her gone on another job. Current Goal: Regain Yosa'Min's trust and help her in anyway she can.